Following a recent conversation on Twitter with Dr. Felicity Gee, who listeners may recall from the Female Experimental Film & Surrealism Episode we did a year or so back in association with MUBI, Dario suggested I write something about the ongoing debates around film criticism using the threaded conversation as the basis. 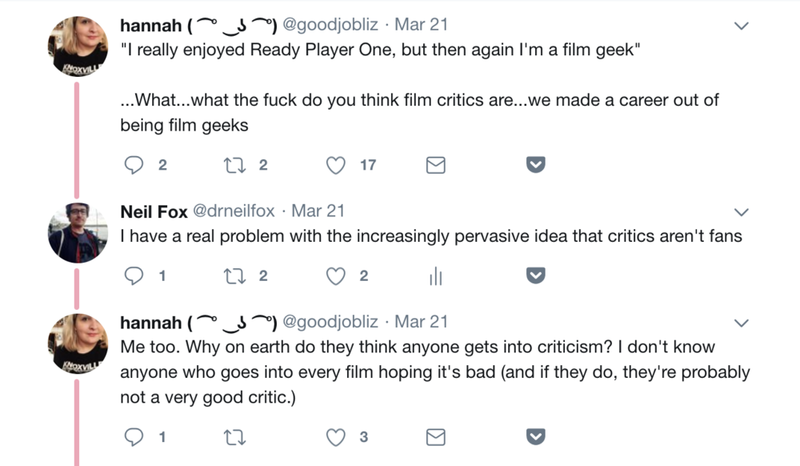 I was reticent at first because the discussion around film criticism is a fast flowing river that it's impossible to place any kind of permanent marker into, as if there ever was such a time of course. I never thought the episode we did on film criticism would be the final word but it has been quite startling to see how debates around what film criticism is, should do, should contain, whether it is needed and how it functions, have spiralled out into so many different areas. What brought me round to the idea was the chance to flag up and comment on some of the recent trends in the discourse and provide links to people talking discussing the subject in different, probably better, ways than me. The ongoing debate about the relationship between aesthetics and ideology shows no signs of abating just as discussions around theory and practice in film education (my main area of academic research) retain singular and often antithetical positions as militantly as they ever have. Recently, debates have been brought to the fore in more public ways through the increased exposure in the mainstream context through significant works by black, women and black women filmmakers in particular. In the last 18 months Moonlight, Detroit, Get Out, La La Land, Lady Bird, Black Panther and A Wrinkle In Time to name a few have led to discussions about film histories and genealogies when discussing films, the cultural position of the audience in the experience, cultural appropriation and historical rewriting, the power and responsibility of the filmmaker in telling stories outside their own cultural position and yes, to what degree ideology matters when discussing aesthetic objects. Still Processing: We Don’t Love Everything Made By Black People and That’s OK? None of the questions and matters mentioned above will be resolved anytime soon if at all, but there is something I do want to talk about here, based on recent social media dialogues I have had, and that's the historical responsibility of film critics. 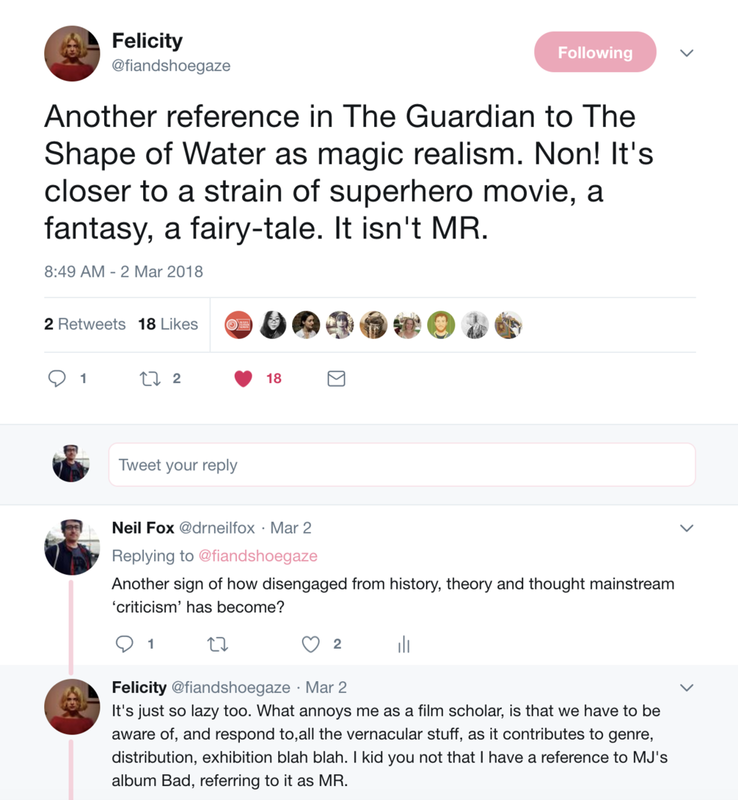 I responded to Felicity's tweet about Guillermo del Toro's The Shape of Water being described as magic realism because of the fact that issues mentioned previously had been circulating in my mind for a while. 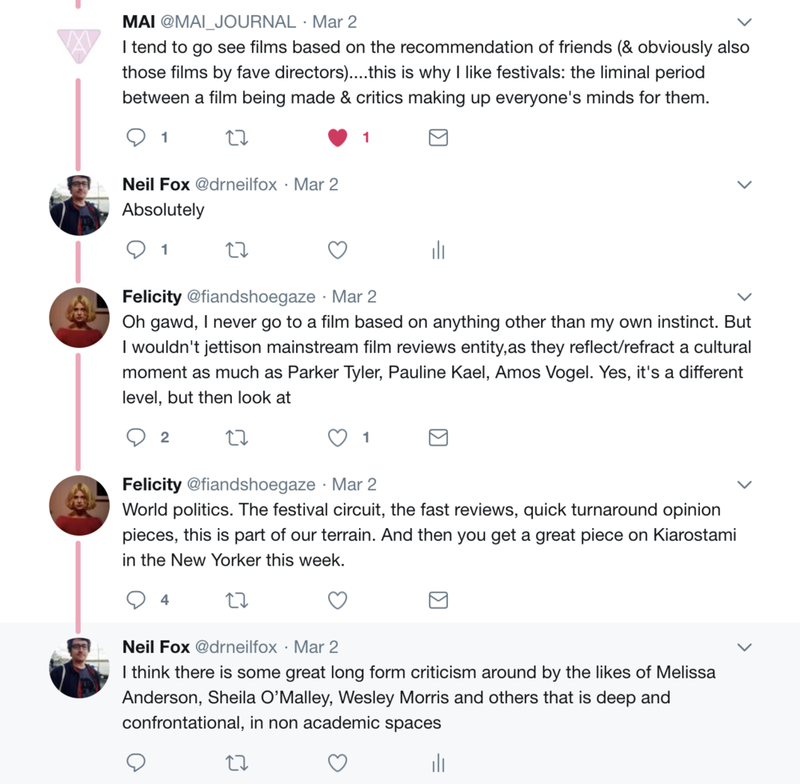 While there's never a true consensus about what good film criticism is (and I'm not proposing there should be) it would seem that one thing many critics agree on is the need for a display of contextual and historical understanding in film writing. Or rather, maybe there used to be agreement. Because, this seems to be a real issue presently. What irked me is that the review in question just claimed that the film was magic realism without ever arguing why or how it could be perceived to be. It took a term from film (and wider art) history and applied it without real thought, muddying the waters of the forms of magic realism and fantasy and thus demonstrating both an ill-conceived appreciation of critical genealogy and a lack of basic research. The argument could be, and frequently is, made that it doesn't matter. But it does. In a 'post-truth' world it matters more than ever. It's not to say that definitions aren't contentious or fluid but that any fluidity should be contended with, not ignored or dismissed. Felicity's position is a defensive one and rightly so. This is her field of expertise, knowledge and labour. She has committed time to its study and exploration and evolution. Flippant criticism undermines the work of those who have provided the basis for good criticism to exist. It shows a lack of respect for the work of scholars and critics, and indeed the filmmakers working within different genres and disciplines, and is part of a wider debate of the responsibility of film critics to know, understand and reckon with film history. So much mainstream criticism has a wikipedia level of depth and is fired off into the ether as quickly as possible to garner hits and views without so much as cursory respect for what has come before and whether the definitions being used are accurate. She superbly deconstructs how conversations round Get Out and Black Panther erased black film history when, on release, they were respectively described as the first black horror film and the first black superhero movie. Ignoring the facts of film history that led to the possibility of Get Out and Black Panther not only existing but being as engaged with black cultural history as they were could be viewed an example of soft racism or unconscious bias, but there's no denying it's symptomatic of wider issues regarding film writing as mentioned above. As Ashley Clark says in our film criticism episode, too many critics don't do the hard work of grappling with a film. Part of this grappling, I would argue, is researching the contexts and being sensitive, smart and introductory for readers about them. Also key is the need to reassess and reclaim forgotten and ignored - for whatever reason - work and artists and reconstitute the elements of film history that are now problematic or have come to be regarded as not as significant as first claimed. Criticism isn't static, it's fluid and is a regularly spiralling conversation. As you can see, I do find it problematic that critics are not seen as fans. The act of criticism should be detached as much as possible (it's impossible to be completely detached) from the subjective and the fannish. However, the desire to write in depth about film or anything comes often from love and the hope of falling in love again never goes away. I've written about films for 20 years and I'm not jaded. This year alone I have already fallen in love with Phantom Thread and You Were Never Really Here and that's just new releases. I've also fallen in love with films from last year I missed and films from cinema's past, because I love cinema. I also believe in the role of the film critic and to a certain extent I have a utopian idealism in the role of the film reviewer. Following my initial correspondence with Felicity our colleague Anna Backman Rogers from the MAI: Feminism and Visual Culture journal, who we write and edit for, joined the conversation and it moved on. It covered as you can see, questions around the role of film reviews, separate we would argue from criticism in many respects though there is an element of Venn crossover. This is my final point I guess. The Venn diagram of Critic - Reviewer - Fan is ever more interlinked and tear-stained and ill-defined. There are those of us who read writing about film who want a lot of the same things - good writing, solid and thoughtful context, aesthetic appreciation, ideological awareness, so we can learn or see something new. All of those things are hard if not impossible to define. Dr Neil Fox is a Senior Lecturer and Course Coordinator in Film at Falmouth University’s School of Film & Television. His research interests include film education, music documentaries and concert films. 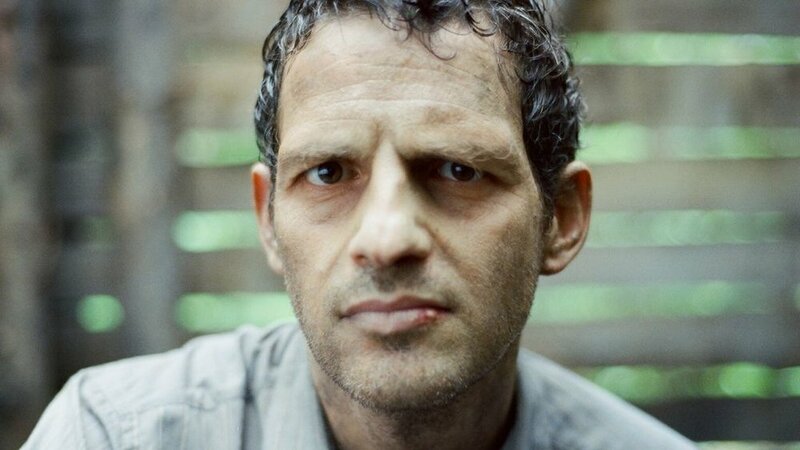 his debut feature film as writer/producer, ‘Wilderness’ played over 15 international festivals, winning 11 awards including for Best Screenplay. He is also the co-founder and co-host of the Cinematologists podcast. If you want to write a blog for the Cinematologists podcast contact us at cinematologists@gmail.com with your details and idea. It's not just a "Film Noir"
The last recording of The Cinematologists’ Podcast was at the Electric Palace, Hastings and discussed Nicholas Ray’s In a Lonely Place (1950). As usual, it was a stimulating evening. The film was illuminatingly introduced by the guys and the audience discussion was very thought-provoking. So much so that I had a few more thoughts that I am going to share…. The film is very often described as “a classic film noir” – including in the Electric Palace’s publicity for the evening. This is fair enough: much of the look and the feel of the film places it under that banner. Generally, of course, we often introduce and discuss films in terms of their genre. However, film noir is bit of a special case as, unlike many others, it was not a “self-conscious” genre. At least not in 1950. Nicholas Ray didn’t know he was making a “film noir”. He wasn’t working within any awareness of it as a framework. The very term betrays its origins within French film criticism and its coining is usually credited to Nino Frank around 1946. French critics like Frank started noticing similarities in style and story between a whole range of American films of the period and dubbed them “films noir”. In fact, it has been suggested that French critics only became of aware of these similarities because they watched a huge backlog of US films very quickly – almost back-to-back - once the Nazi occupation (when Hollywood films had been banned) was over! Anyway, the point is that the term “film noir” was unknown in the US until the late 1960s when critics, then audiences and then film-makers began embracing it. At the time there was no awareness of its “existence” – nobody had grouped the films together. The key thing to realise, therefore, is that if Nicholas Ray had been assigned a “western” or a “horror” to direct in 1950 he would have had a reasonable understanding, by then, of that genre’s store cupboard of possible ingredients - in terms of character-types, incident, iconography etc -that he could deploy, mix, ignore or twist. He could also be confident that his audience also had a set of expectations about each genre that he could rely on and use. We could therefore talk confidently about how the film reflects this conscious awareness. 2. It’s not just a "film noir"
I think in general a focus on genre can sometimes lead to a reductive “checklist” approach to a film like this. We get bogged down in concentrating on the elements that fit the template of expectations and conventions associated with that genre. This can be very illuminating. In a film like In a Lonely Place it leads us back to questions of context – the original noir films are particularly associated with a very historically specific mood of anxiety and dislocation stemming from a complex of post-war factors: the damaged men returning from battlefields; women liberated by war-time employment, the emergent cold war and McCarthyite paranoia and so on. We can certainly detect traces of all these in the film. However, it does mean that some of the discussion of the film tends to only focus on its “noir”-ness and downplays or ignores features of the film that don’t fit the template. 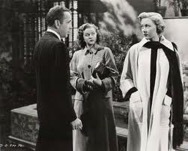 The case of In a Lonely Place I think there is a lot more to uncover and discover about the film than just its noir status. As with so many (all?) films there is all sorts of hybridity going on – mixing the elements of other genres like romance, romantic comedy (even “screwball comedy”), “suspense” (which is how the film was described in its publicity at the time), procedural crime etc. There is a signal focus too on the idea of a dangerous man (a “homme fatale”) which is rarely found in the rest of the films usually assigned to the noir label. This is part of a bigger question of how useful genre is as a way of approaching any film. In the end, of course, genres don’t make films, film companies do (at least in the commercial sector). 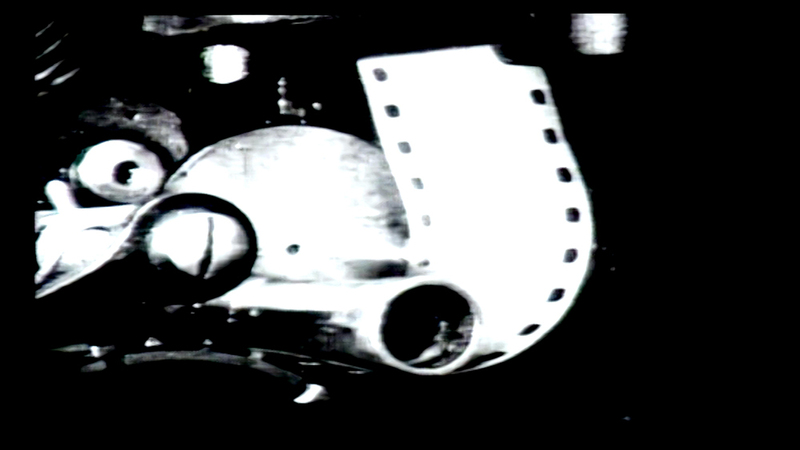 A film, even in 1950, is an expensive risk and therefore the films that are made can be usefully understood as attempts to minimise the chances of them making a loss. 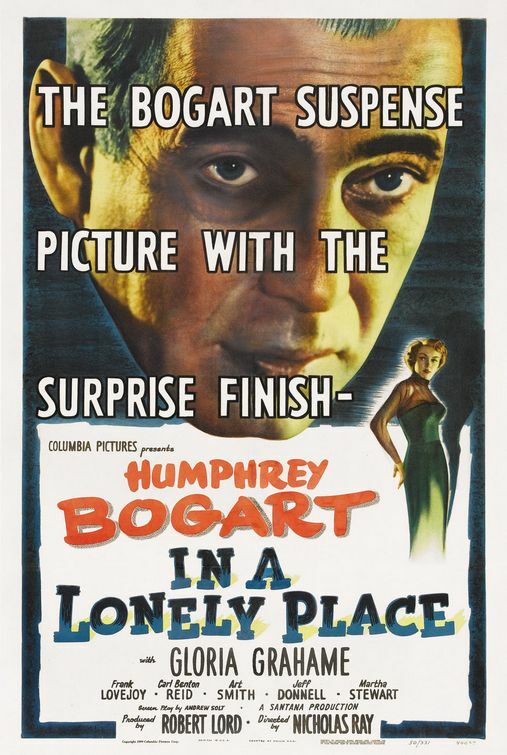 We can, therefore, identify the factors about In a Lonely Place that enabled it to be made: Ray’s track record as a reliable director, Bogart’s huge fan-base and a popular novel as its (distant) source. These are the sorts of elements that enabled the making of many Hollywood films of the 1920s, 30s and 40s. However, I would argue that two factors about the American film industry in 1950 made it possible for this film specifically to exist and to exist in its actual surprising final form (the downbeat ending, the “anti-hero” protagonist etc). One would be the breakup of the Studio System. Thanks to US Government anti-trust legislation (the 1948 Paramount Decrees) the old majors were withdrawing from the factory-style production they’d practiced for years. Stars, directors and others were being released from their old restrictive studio contracts and some were using their power and money to start their own independent production companies. Which is exactly what Bogart did in forming Santana Productions (named after his yacht). One of Santana’s films was, of course, In a Lonely Place. Bogart chose the film, the director (an old friend, apparently) and approved the script. Ray and Bogart were therefore enjoying a degree of creative autonomy (cushioned by Bogart’s bankability and loyal audience) relatively unknown in the studio era. They could try new things such as challenging star and story expectations. Incidentally, a few small independent film production companies had existed in the studio system era – mostly surviving by providing the low-budget B-pictures that went with the majors’ A-pictures in double bills. Interestingly, these “poverty row” companies are sometimes seen as one of the cradles of what would become known as “film noir”. Also, to give another example to Dario’s (on the podcast) list of links between "film noir" and the French Nouvelle Vague, Godard dedicated A Bout de Souffle to one such B-picture company making “proto-noir”- Monogram Pictures. Secondly, in parallel there was also the accelerating decline of the cinema audience. In 1946 weekly US attendances had peaked at 83m per week. By 1950 it was down to 60m and dropping. The main reason of course was the effects of TV (by 1950 The Ed Sullivan Show was already 2 years’ old). As is well known the history of Hollywood ever since (or at least until recently) has been the history of attempts to draw people away from their sofas by doing things that TV couldn’t or wouldn’t do. Famous examples from the 1950s include the transition to colour, experiments like 3-D and smell-vision etc and, eventually, the development of teen-pics aimed at the section of the audience who were still turning up to the cinemas (which, of course, Ray would benefit from a few years later with Rebel without a Cause). In the case of In a Lonely Place it could be an early example of writers, directors and producers realising that one way to try to compete with TV is to provide something more challenging, downbeat and “adult” than the safe and sanitised “family entertainment” TV provided. (I wonder too if there was an awareness that amongst the audience were many men who had returned from the horrors of war who wouldn’t be satisfied with glamour or simple escapism?). These two industrial factors combine in a freedom and push for something different that results in such an interesting and odd film which in some ways prefigures some of the even more challenging films of the 1960s (starting with Psycho). 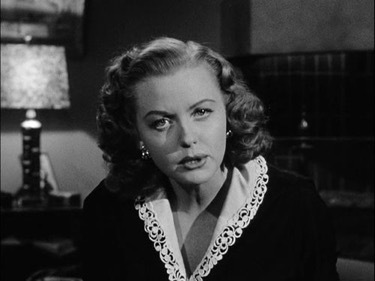 This can be seen in countless films up until the present day, including many films falling under the film noir label. 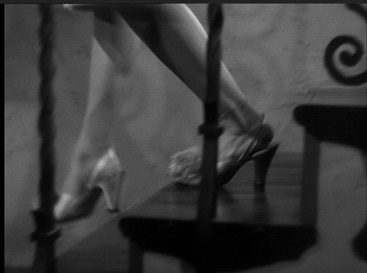 For instance, in Double Indemnity (Wilder, 1944) when our hapless protagonist Walter first encounters femme fatale Phyllis the camera cuts to his point-of-view of her semi-clad body and then her legs coming downstairs. Against this background, one of the interesting things about In a Lonely Place is how powerful and independent Laurel’s gaze is, especially in the first half of the film. There’s the way Laurel returns Dix’s appraising gaze that first night. There’s also the way she turns and stares at him in the police station the next morning – long, hard and with self-possession. It feels quite unusual to have a female character be so in control and bold in their looking (and, apparently deriving some “visual pleasure” from it). There is also a very interesting moment that I hadn’t really appreciated until I saw it again on the big Electric Cinema screen. When Mildred, the doomed hat-check girl, begins telling Dix the story of Althea Bruce at his apartment the camera cuts to a Point-of View (POV) shot from Dix’s position. The protagonist’s POV is a standard device in Hollywood films, attempting to build audience identification with the “hero” – literally seeing things through their eyes. However, in this case the object being viewed is not just being looked at– they are talking directly to the protagonist which means that Mildred is directly addressing the camera and thereby us. This is interesting because it is such a rare example – I was always taught that directors of the “classic period” avoided it (except in comedies) because it breaks the 4th wall, reminds the audience of the camera etc. (This supercut https://vimeo.com/60845952 shows examples and nearly all are from the 1960s on, except – interestingly a moment from Sunset Boulevard). Maybe this is another example of Ray flexing his creative freedoms in a new post-studio era? Profiles of Ray often point out that he studied architecture (with Frank Lloyd Wright) and that the visual design (“mise-en-scene” as those French critics called it) of his films often showed a careful attention to how sets and their décor can be used to create mood and give the audience subtle clues to characters and relationships. One example is the design of Dix’s apartment and its extraordinary metal grilles – internally and externally. More generally, throughout the film are countless shots of gates, grid patterns, plaids and checks – all perhaps communicating a sense of entrapment and the barriers between characters. Which actually brings us back full circle. Grids, bars, barriers are often seen as one of the key visual motifs of “classic film noir”! Peter Blundell taught Film Studies in Further and Adult Education and recently retired as Curriculum Leader for Media as Sussex Downs College, Lewes. He tweets as @peterablu and is on Instagram as thirstierwater. If you are interested in writing for The Cinematologists Blog please email us at cinematologists@gmail.com with your idea. What is it about donkeys? There is something enigmatic and appealing about donkeys. This axiom, asserted by Kathy Hubbard, director of Shetland Arts Screenplay Film Festival in Shetland in her introduction to festival hit Donkeyote (2017), was met with murmurs and nods of approval from a packed audience. But why should this be the case? Maybe it’s aesthetic: the floppy ears, the melancholy gait, the toothiness preceding that elemental bray. Or is it something more ineffable? Stoic reliability, unswerving companionship, a kind of existential absurdity, or are donkeys merely a symbol of life's long, hard precarious journey? In case you think I might be overdoing the hyperbole, such allusions are palpable in the form of Gorrión, the equine star of Chico Pereira’s poetic, poignant, amusing and, of course, quixotic film. The human protagonist of Donkeyote, Manolo (the uncle of the director), is less an embodiment of the knight-errant and more a fusion of Cervantes’ eponymous hero and his ironic sage Sancho Panza. 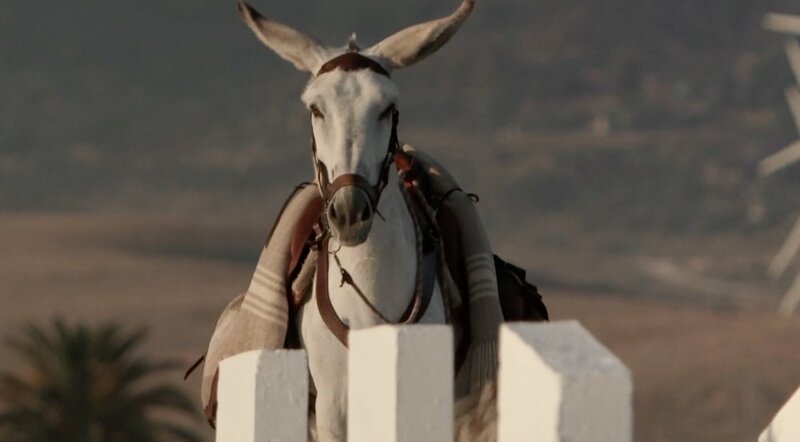 Living simply in southern Spain, Manolo personifies a history of romantic ambulation through nature in harmonious, even mystical accord, with his dog, Zafrana and beloved donkey. His tireless marching onwards is seemingly an existential drive but at 73 and with failing health, Manolo plans a final adventure following the Trail of Tears, an iconic passage forced upon the Native American Cherokee Nation, 2000 miles, East to West across America. But not without Gorrión. Reactions to this hare-brained scheme, incredulity from his daughter Paquita - “America? America? AMERICA? she exclaims in disbelief - and barely veiled derision from travel agents and other bureaucrats, point to a central theme: the boundaries imposed by the modern age. Shots of man and beast coming up against all forms of barriers permeate the film. The physical ones - wire fences, roads, train lines, rivers – are negotiated (or not) in various ways. One of the most comedic scenes stems from Gorrión’s reluctance to cross the water on to a ferry; Manolo’s vexed impatience turns to jovial resignation and then empathetic coaxing. But perhaps the more telling obstacle is that of communication. The trials of learning English, shooting a video appeal for money for the trip, and the conspiratorial rejections of officials whose obstructive mind-set can in no way grasp the romance of this dream, imbue a tragi-comic tone. Manolo embraces the technologies of communication, he is no luddite, but the more channels he explores the further he seems from his ultimate goal. The encroachment of technological development is a recurrent visual metaphor that reflects how the natural freedom of the environment is compromised by modernity's striation of space. A simple trek with one's donkey thus becomes an Odyssian endeavour. Pereira’s intellectually ironic style with neorealist echoes is evident in his debut film Pablo’s Winter (2012), but this latest project is layered with a personal undercurrent which, on the one hand, gives the film its depth, drama and humour, but on the other opens up questions about cinema as document. There is nominally an observational relationship between filmmaker and subject yet the dramatic situations and visual compositions have clear structure and arrangement for us to witness. So, in one sense the director remains at a distance; no voice-over or explicitly questioning interjection seeks explanation (only at one moment, when Manolo wakes up in genuine pain, is the observational illusion explicitly broken). Yet there is a subtle complicity between Pereira and his uncle that emerges though the film's formal approach. A glint of awareness in the eye of Manolo suggests he is very much in on the yarn. Furthermore, the film is cut in such a way that reaction shots of Gorrión, along with his endearing antics, invite us to project an anthropomorphism. And close-ups using a wide-angle lens evoke a deep connection between man and animal. There could be an accusation that this is not documentary at all, but a kind of fictionalisation of authenticity. Realist rather than reality. Yet, to me, Donkeyote possesses a knowing sensibility which deliberately transcends the porous boundaries between fact and fiction. Pereira's work can therefore be aligned with the post-Oppenheimer tendency in documentary; filmmakers actively challenging the mechanics of documentary form and even puncturing the false dichotomy between objectivity and subjectivity. This is a film that can be easily taken as a low-key, heartwarming tail of an eccentric old adventurer's symbiotic relationship with his donkey. But a slightly deeper look offers meditations on the man's relationship to nature, the boundaries imposed by modernity, and even the essential nature of communication and companionship. Dario speaks to the producer of Donkeyote in Episode 51 of The Cinematologists Podcast. Werner Herzog has always been a curious director. Puzzled by the world and eager to encounter its mysteries, Herzog’s inquisitive eye routinely pits the enigmas and harsh realities of the outside world against the human psyche and material body. From German deaf-blind communities to Tibetan Buddhist pilgrimages, and from the Kuwait oil fires to Alaska’s grizzly bears, Herzog’s documentaries in particular revolve around curious case studies that aim to unsettle our grip on the world. When at their best, these documentaries foreground the question of life itself: if the outside is quite so unlivable and so obscene then how do humans continue to live in it? As Herzog puts it early on in his career, miming Martin Heidegger’s fundamental question of metaphysics, “why is there Being at all, rather than Nothing?” The power of Herzog’s work often derives from the ways in which it intensifies this uncanny experience of human life, an effect that Gilles Deleuze once described as Herzog’s obsession with opposing the small and the large, the human against the sublime. Werner Herzog is also curious as a director. A routinely self-mythologising figure, his signature brand of dour, Bavarian-inflected English has taken on a bizarre resonance in the internet age. Recent celebrity voice-over turns and cameos in Parks and Recreation and The Simpsons have provoked critics to either become protective of his supposed “genius” or lament his turn towards superficial self-aggrandising. But to chastise Herzog’s memeification is to forget that self-mythologisation has always been part of the director’s modus operandi. From Of Walking in Ice (1978) to his conversations with Paul Cronin – republished in 2015 as A Guide for the Perplexed – Herzog has long cultivated an image of himself as a semi-fictional character. It is odd then, that critics of his recent films have tended to focus quite so sharply on the director’s apparently newfound celebrity, when it has been so much a part of the director’s deliberately constructed mystique. One problem with curiosity, though, is that it often leaves politics behind. For if the world is thought of as merely a curiosity – a thing to be looked at, admired or probed – then it also becomes a static object, a museum artefact rather than something that is constantly being reshaped. This might explain why there is a darkly comic nihilism that pervades Herzog’s documentaries; curiosities do not often demand political or ethical responsibility from their viewers. But just as Herzog treats the world as a curiosity, the same relation holds for Herzog’s critics. It has become something of a commonplace to treat Herzog as a curiosity, as a masculine adventurer expounding comic faux-philosophy, always more important than the films themselves. Reviews of his later work, tinged as they are with sardonic laziness, have become a rather predictable affair: begin by talking about the director’s obsessive cinematic vision, provide a few sentences on the “ecstatic truth” of Herzog’s infamous Minnesota Declaration, and don’t forget to mention he once ate his shoe. If Herzog’s documentaries tend to leave politics behind then what do they interrogate in its place? This is where Deleuze’s notion of the small and the large enters the frame. What the French philosopher identified some thirty years ago is the way that Herzog’s films capture a sublime natural-historical struggle between the individual human and the overwhelming scale of the world. This is why Herzog’s 1992 documentary Lessons of Darkness is quite so controversial: here the aftermath of the Gulf War is abstracted from its particular geopolitical reality into an apocalyptic narrative of the end of the world itself. 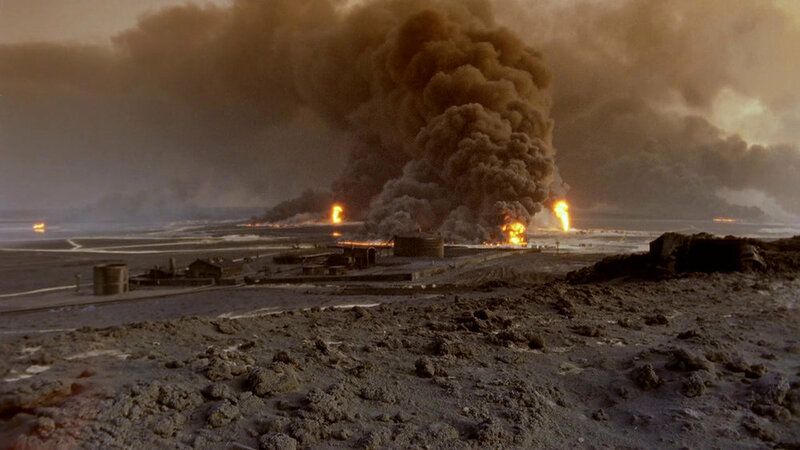 Herzog thus transforms the specific event into a metaphor: the oil fires are no longer just oil fires, they are also a grand battle between life and death. On the one hand then, Lessons of Darkness depoliticises and indeed forgets the Gulf War entirely; but on the other hand, the film might be saved from itself if we were to say that the Gulf War was quite literally the end of the world for the thousands of Iraqi and Kuwaiti civilians who died. Such interplay between the curious and the sublime are in evidence throughout Herzog’s work. A critique of his late period documentaries might suggest that the sublime scale of the large overwhelms his attention to the detail of the small. However, traces of Herzog’s magnetic, naïve curiosity take on new shape in what I suggest are pointed moments of refusal, specifically, Herzog’s refusal to indulge the audience’s curiosity. This idea animates one of the most famous scenes in Grizzly Man (2005), a film which focuses on the life and death of bear enthusiast Timothy Treadwell. In the film Herzog interviews Jewel Palovak, a close friend of Treadwell’s, who owns his VCR and with it the hundreds of hours of audiovisual footage that Treadwell recorded when in Alaska. The recordings culminate in Treadwell’s death itself: with the lens-cap left on, though, all that is captured is the horrifying audio of Treadwell and his girlfriend Amy Huguenard being mauled to death by a grizzly bear. Herzog makes a crucial decision here not to include this audio in his film. Instead, the director films himself listening to the audio alone, headphones on. But this is not quite an accurate description. To put it more precisely, the scene begins with the director filming himself, but then the camera slowly starts to zoom over Herzog’s shoulder, leaving him behind and focusing instead on Palovak’s body language as she watches Herzog listening. Grizzly Man therefore reaches its crescendo at precisely its quietest moment: silence becomes more powerful than spectacle. What begins as merely another scene in which Herzog indulges his own curiosity transforms into one of the most complicated, enigmatic and perhaps even ethically attuned of Herzog’s oeuvre. Here Herzog’s refusal to feed the audience’s desire for spectacle, in fact, provokes a more intense mode of captivation. A subtle moment of refusal, however, is at the centre of Lo and Behold. One of the film’s numerous case studies features the Catsouras family, whose daughter Nikki died in a car accident in 2006. The family’s grief is riven with anger at the onlookers, dispatchers, and internet trolls who shared horrifying images of their daughter’s disfigured body. Despite the strange rigidity of the scene – filmed with oppressive lighting, and with the family awkwardly positioned like a row of mannequins – Herzog cultivates and then cuts off our curiosity: “Hoping to avoid a new wave of sick curiosity, we are here not even showing a picture of Nikki alive, only a place in the house she liked.” As if to deliberately counteract the dark desire to see, Herzog instead leaves the camera lingering on an empty room. Despite his concerns with an altogether different geographical and conceptual terrain, the Herzog of Into the Inferno also refuses to let his curiosity get the better of him. 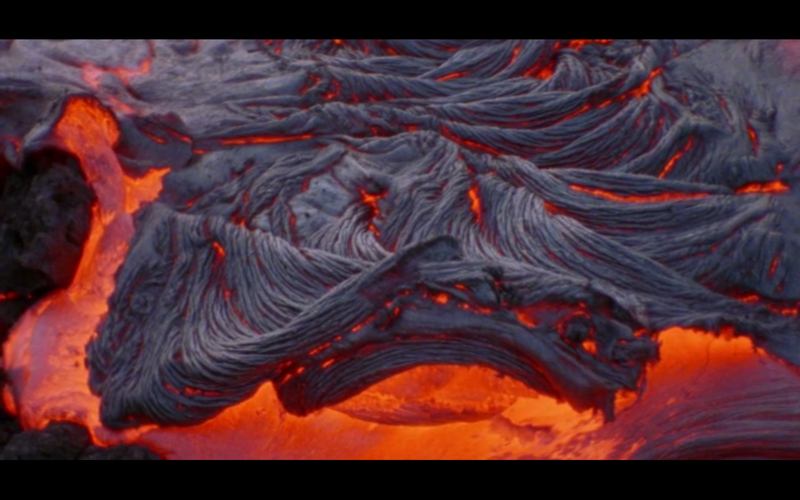 When asked by his co-director Clive Oppenheimer whether he wants to descend into a volcano, to get as close as possible to the lava below, Herzog replies with an unequivocal no. 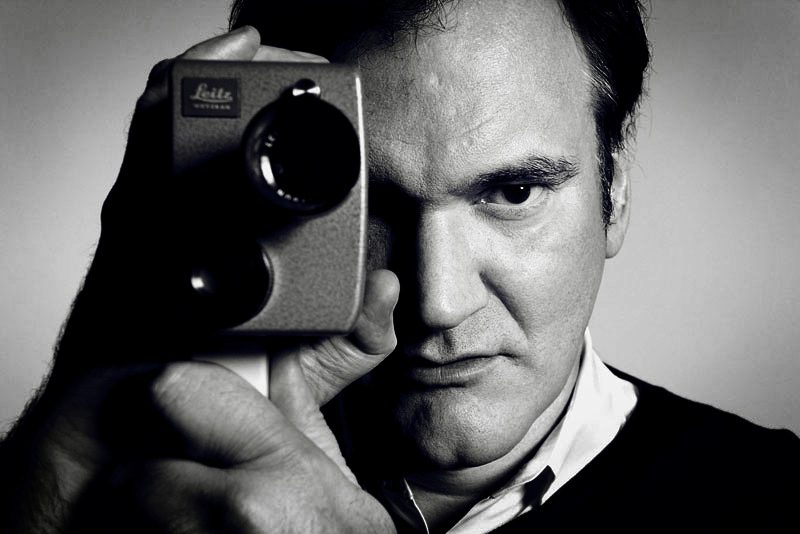 It would be entirely stupid, he says, to risk his life for an image: “I am the only one in filmmaking who is clinically sane.” The irony is very much intended. It is strange to think of Herzog as a precautionary filmmaker, not least because the aura that has been manufactured over the years – by both Herzog himself and by his critics – always tends to emphasise the danger and risk of his cinematic exploits. But what Herzog’s late documentaries show us is that, despite his longstanding penchant for curiosity, there is an overriding sense in which his films are never quite reducible to their excessive and adventurous motifs. Rather, the most gripping moments of Herzog’s later films are those in which curiosity is obscured, withheld, or completely refused, in a move that uses the sharpness of the small to pierce the depth of the large. Dominic O'Key is a PhD candidate in comparative literature at the University of Leeds. He wrote his my MA dissertation on Herzog's Cave of Forgotten Dreams and has a chapter on Herzog and crocodiles coming out later this year in a book on animals and biography. He can be contacted via email: dominic.okeys@gmail.com. Follow Dominic on Twitter: @oquays.